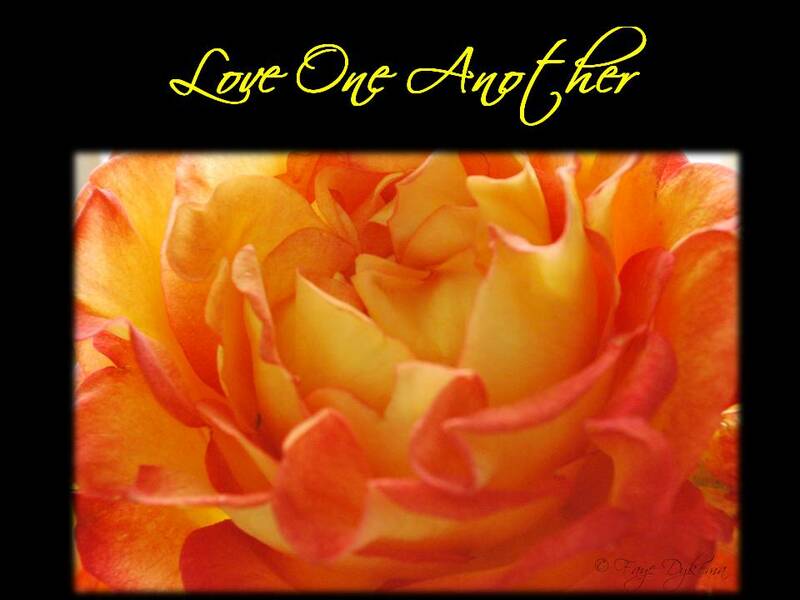 love one another | God's Abundant Blessings! In the days, weeks, and months ahead there will be many needs following the catastrophic disasters. Realize that God has given you at least one precious gift you can share with others as they rebuild their lives. Anyone who believes in Jesus Christ as their Savior and Lord, admits they have sinned and believes in God is filled with the Holy Spirit. The Holy Spirit gifts us with a variety of spiritual gifts such as: hospitality, creative abilities, teaching, knowledge, faith, prophecy and many more. We are to use these spiritual gifts to build up others, help others, and care for each other. However, as 1 Corinthians 13 says, if we do anything for others and we don’t have love, we are nothing. We need to be filled with Christ’s love to help others. Otherwise it is just empty words and actions. Check out 1 Corinthians 12-14. Very simply – spend some time this week to encourage someone, show God’s love to them, thank them for who they are, what they have done for you or someone else. When I married my husband 35 1/2 yrs ago, we had this song in our wedding – “Love one another, love one another, as I have loved you. And care for each other, care for each other, as I have cared for you. And bear one another’s burdens, and share each other’s joys, and love one another, love one another, and bring each other home.” For some reason, that type of love has been relatively easy to share with my husband over all these years. God has blessed us greatly in our relationship. But oh how I wish I had lived that type of Godly-love for my fellow brothers and sisters in Christ! There have been way too many fellow believers over the years who are walking-wounded because of my sinful words or actions. Living in a small town the past few years and getting to know many people following the 2008 flood, there have been good and bad times as well. Recently some hurtful words were said about me. As God has been working on healing and restoring, He’s put some of the people who were involved back into my life. I’ve wanted to ignore them or retaliate. However, after studying 1 John daily for eleven weeks, I’ve been reminded over and over again, I’m supposed to LOVE these people with the love of God and the love of Christ because I love God. God’s love shows us redemption and grace through sacrificial giving. Christ’s love shows us sacrificial giving through obedience and humility to God’s will. So I’m asking myself, especially with difficult people, “Am I showing them the love of God and the love of Christ in my words and actions?” There are so many times I’m grateful that my thoughts are filtered through God’s love before they come out of my mouth. By sharing God’s love, something good happens, not only to the people we love, but also in us. God’s abundant love and grace poured out on others is a transforming gift to us.